With a new year comes new opportunities, and our award-winning aviation training team is excited to announce their 2017 pilot training line-up. This year, we’ll be offering everything from self-study materials to eLearning courses as well as instructor-led seminars for the GTN, G500/G600 and all Garmin Integrated Flight Decks. Comprehensive instruction will be available for our most advanced avionics currently being installed in Part 23, Part 25 and Part 27 aircraft and introducing many in the experimental category as well. 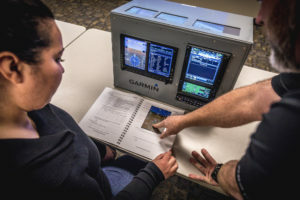 We will be hosting instructor-led training courses for GTN series and G500/G600 avionics on select dates at the Garmin headquarters in Olathe, Kansas, as well as four regional locations throughout the year: Vero Beach, Florida, February 23-24; Salem, Oregon, June 22-23; Frederick, Maryland, September 21-22; Chandler, Arizona, November 2-3. These two-day courses explore all of the capabilities that the G500/G600 and GTN series of navigators offer in a hands-on, scenario based training environment. Our instructor-led training courses provide a hands-on, scenario-based training environment. Our instructors are also capable of providing instruction on any integrated flight deck currently being installed in Part 23, Part 25 and Part 27 airframes, including the G1000, G3000 and G5000. These on-demand courses are offered on a first-come, first-served basis over a two or three-day period. Each of these classes can be tailored to the needs of the customer and can be offered at the Garmin headquarters in Olathe, Kansas, or at a location provided by the customer. To see our full 2017 lineup with price information, explore our pilot training catalog, here. For additional information on training opportunities, please contact the Garmin Aviation Training team at aviation.training@garmin.com. The post 2017 Pilot Training Opportunities Announced appeared first on Garmin Blog. Powered by Ecoevo web services.